Did Howard Hawks go out with a whimper or a bang? Bangs & Whimpers is a new series in which we take a look at the final movies of acclaimed and significant filmmakers. In this first instalment we examine the final work of Howard Hawks. Like Alfred Hitchcock, Howard Hawks is a classic example of a Hollywood filmmaker whose body of work was ignored by Awards voters but celebrated by critics, cinephiles and general audiences. Also like Hitchcock, he's a filmmaker whose career began in the silent era (1926's The Road to Glory) and ended in the 1970s at a time when a new breed of young director was reshaping Hollywood in the wake of the collapse of the studio system and the relaxing of censorship. The film that adds a period to Hawks' filmography is the 1970 western Rio Lobo. 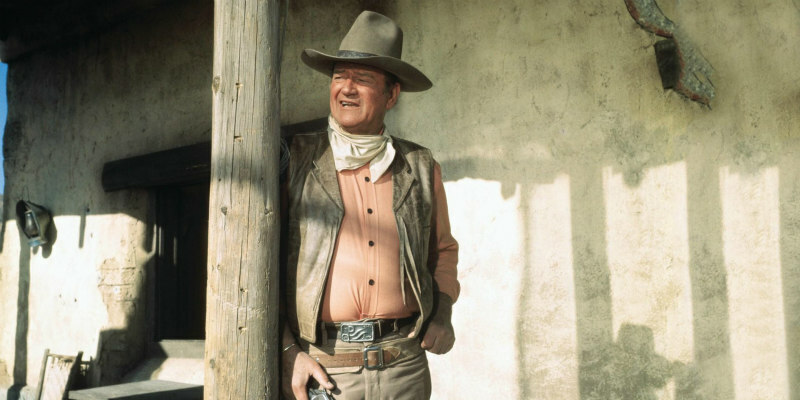 Hawks proved himself a master of the many genres he turned his hand to across 46 films, but some of his best movies came from the western genre, and the best of those (Red River, Rio Bravo, El Dorado) starred John Wayne. If John Ford shaped Wayne's screen persona, Hawks added some heart to The Duke. In Hawks' films Wayne is the strong, totemic guardian of justice seen in his Ford films, but with added warmth and humour. In Rio Lobo, Wayne is essentially playing the same character he previously essayed in Rio Bravo and El Dorado, a father/brother figure to a collection of flawed but well-meaning characters. All three movies share similar plot elements, and all end in a scenario in which the heroes assemble at a Sheriff's station under siege. Rio Lobo takes longer to get to that point than the previous two films, opening during the Civil War, where Wayne's Cord McNally is a Yankee Colonel who arrests two Rebels - Pierre Cordona (Jorge Rivero) and Tuscarora Phillips (Christopher Mitchum, son of El Dorado star Robert) - following an elaborate train robbery. Soon after, the war ends and McNally meets up with Cordona and Phillips, buying the men drinks and putting the conflict behind him in an attempt to glean information on who the traitor within his ranks that helped facilitate the heist might be. This leads McNally to the Texas town of Blackthorne, where he runs into Shasta Delaney (Jennifer O'Neill), a young woman seeking justice for the murder of her employer by a Sheriff's deputy in the neighbouring town of Rio Lobo. It seems Rio Lobo is under the corrupt rule of a man named Ketcham (Victor French), who is forcing farmers off their land. One such farmer is the father of Phillips (Jack Elam), who teams up with McNally, Phillips, Cordona and Delaney to take down Ketcham. Rio Lobo is bookended by the film's highlights, a pair of well mounted action sequences. The opener is an innovative train heist that keeps the viewer guessing as to how the robbers intend on pulling it off. It's arguably the most elaborate action sequence in any Hawks western, and benefits greatly from the work of second unit director Yakima Canutt, the unsung hero behind Ben Hur's chariot race. The finale is all Hawks however, as two opposing groups face off in a trade that ends in bloodshed. As it's three years since Bonnie and Clyde introduced graphic violence to mainstream American cinema, blood is literally spilled here, though much like Hammer's 'Kensington Gore', it's an unconvincing shade of scarlet. A moment of genuine shock comes when Ketcham's crooked Sheriff slashes the face of a rebellious prostitute (Sherry Lansing, who would retire from acting soon after and become the successful head of Paramount Pictures). Such concessions to American cinema's new realism jar with the classical cinematography of the great William H Clothier - who gives Rio Lobo an aesthetic otherwise more in keeping with the classic westerns of the '50s - and Jerry Goldsmith's old-fashioned but effective score (highlighted by a close up of plucked guitar strings in the opening title sequence). The trouble with Rio Lobo is that everything in between those aforementioned opening and closing sequences is decidedly second rate. After Hawks sacked original screenwriter Burton Wohl, he brought on one of his great collaborators, Leigh Brackett, the woman responsible for the crackling dialogue of The Big Sleep, Rio Bravo and El Dorado. Forced to knock out pages of script while the film was actively shooting likely affected Brackett's ability, as Rio Lobo boasts none of the memorable lines or character interplay of her earlier (and later; see The Long Goodbye and The Empire Strikes Back) work. Perhaps if Wayne had been playing off co-stars of the quality of those who shared the screen with him in Rio Bravo and El Dorado, it may have papered over the cracks somewhat. Glaringly, Rivero, Mitchum and O'Neill have none of the charisma (or indeed basic acting ability) of Dean Martin, Angie Dickinson or Robert Mitchum. Western staple Elam is a welcome late addition in a curmudgeonly role you might expect the great Walter Brennan to occupy, but too much of the film forces us to endure the unconvincing flirtatious dynamic between O'Neill and Rivero - not so much Bogie and Bacall as bogus and banal - while Wayne stands around awkwardly like an old man waiting for his grandkid's soccer game to finish. That Wayne had just won his first and only Oscar for the previous year's True Grit - a film which saw him share the screen with youthful stars in far more convincing fashion - makes it all the more wasteful of his unique presence. 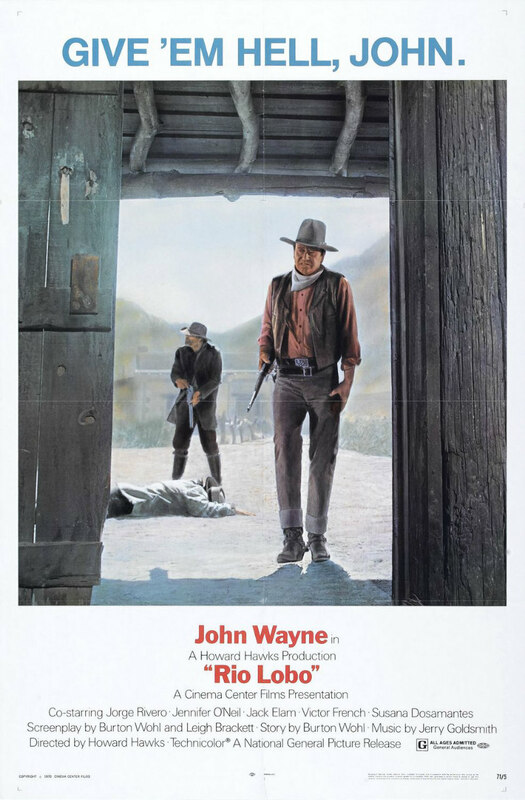 Wayne still had a few great performances in him, going out on a high with 1976's The Shootist, but for his director, Rio Lobo was the end of the line. Hawks would hang up his viewfinder and pass away at the age of 81 from a stroke at his Palm Springs, California home in 1977. The verdict: Did Howard Hawks go out with a whimper or a bang? Despite the strength of its opening and closing sequences - enough to recommend Rio Lobo to western fans - too much of Hawks' final film suffers from the uncharismatic and amateurish performances of Wayne's young co-stars, and the rehashing of elements from earlier films does it no favours. Sadly, we'll have to call this one a whimper.